Is full as big, or bigger than Starling: the Bill black; above the Basis of the upper Mandible are black Feathers, which run in a narrow stripe cross the Eyes, meeting a broad black stripe, which encompasses the Head and Throat: its Crown-feathers are long, which it erects at pleasure: the Back of a dusky purple: the interior vanes of the larger Quill-feathers black; the exterior, blue, with transverse black lines cross every feather, and their ends tipt with white: the Tail blue, mark'd with the like cross-lines as on the Wings. They have the like jetting motion of our Jay; their Cry is more tuneful. The Hen is not so bright in colour, except which there appears no difference. This Plant is usually found in moist places: it sends forth from its root many green Stems, whose Branches overspread whatsoever stands near it, to a very considerable distance; and it frequently climbs above sixteen foot in height, growing so very thick, that in Summer it makes an impenetrable Shade, and in Winter a warm shelter for Cattle. The Leaves are of the colour and consistence of Laurel, but in shape more like the Bay, without any visible veins, the middle-rib only excepted. 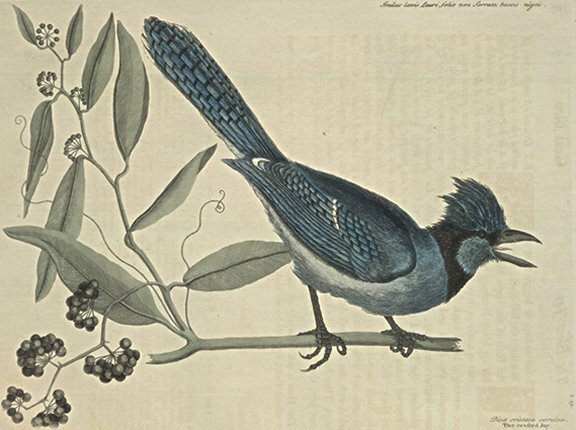 The Flowers are small and whitish; the Fruit grows in round Clusters and is a black Berry, containing one single hard Seed, which is ripe in October, and is food for some sorts of Birds, particularly this Jay.